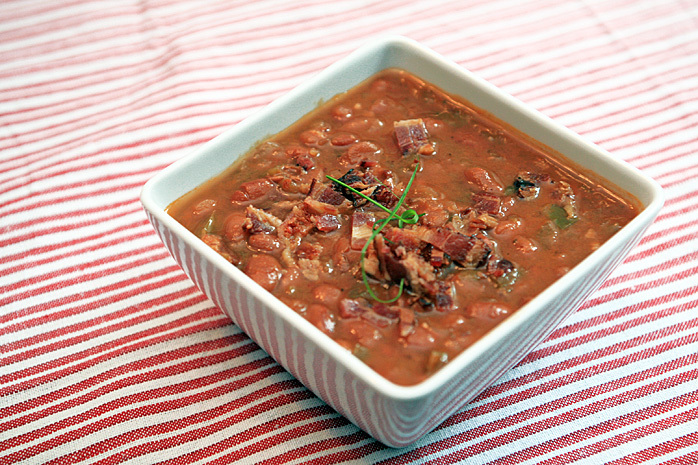 Nothing says “hello BBQ” like a big pot of yummy baked beans. What’s a cookout without them? We always thought that baked beans were one of those classics that took hours of babysitting. We always took the short cut and poured it from a can. We were very wrong! Not only are they super easy to make, it’s also cheap to make. For us, this summer and fall essential will never come from a can again. Soak dry pinto beans in cold water for 2 hours. Sort out any rock fragments. In a dutch oven, sauté the bacon pieces until fat is rendered and crispy. Remove and drain on a paper towel, separate 1/2 to save as garnish. Add bell peppers and onions to the pot, and cook until soft and slightly brown. Add the beans and cover with water by 1 inch. Bring to a boil and add the brown sugar, ketchup, mustard, red pepper flakes, salt, pepper, garlic and half of the bacon. Reduce the heat to a simmer, cover and cook until the beans are tender and the liquid is thick, about 3 to 4 hours. Garnish with extra bacon.